In today’s world, gun free zones are everywhere. Schools, government buildings, sports and entertainment venues, and many businesses. What are some of the laws that address and deal with these gun free zones? What is the current political climate surrounding the issue? And what can you do to remain safe and what are some tactics to be aware of if you must frequent one of these so-called “Gun Free Zones”. We dive into this topic today. Today’s episode is sponsored by our latest product, “Digital Portable Firearm Vault.” This small and portable safe is perfect for a home emergency safe or for keeping in the car for those times you cross state lines or visit the dang post office. Easy to operate with a key override, securable by mounting with bolts or a security cable, and solidly constructed with 16 gauge cold rolled steel; this safe is priced below its industry competitors. Check it out at www.concealedcarry.com/gunsafe and listen to the podcast for a 10% off coupon. Hi Thanks Great Program and Information, nice to be reminded. I am a Police Chaplain and a Hospital hospice Chaplain and to complicate matters, also a Pastor. I don’t know if you have spoken to this. I am allowed to carry on duty and also as I go to our local courthouse often and am allowed ,my thinking this is a privilege not a right. here in Indiana. I have my permits and have for years and always worked in some capacity with police yet not as a sworn officer. More, on the request of the Duty or Officer in Charge. Know how to shoot their gun ,go to the range etc. In our area we work along with local ,county and state Depts. and it seems to work. My Lawyer I retain is Guy Relford a well known 2nd amendment Lawyer in Indianapolis through the USCCA. Thanks for any input of future programs,I know Church is a hot topic and I believe God protects but He expects us to have common sense. Here in SC we I get my stamps at the super market but must be concealed carry. You guys are great with your topics, learning a lot, keep up the good work. Thanks SO much for listening and for the SUPPORT! It’s listeners like you that give us the motivation to keep producing more episodes! And it’s a few days late, but I hope you had a Happy Easter as well! Thank you! If they are not targeting “Gun Free Zones” & it happens to be coincidence and just where large crowds gather, why do you not hear about mass shootings or ANY shootings at gun & knife shows? One thing you’ll learn about me if you get to know me a little more is that I care a great deal about being accurate in what I believe and say. I am extremely critical about anything I am told is fact. I have been raised to QUESTION EVERYTHING! So when I say I am not convinced that mass shooters specifically target “gun-free zones,” it’s just that–I am not convinced that it is a 100% factual statement. I’m NOT saying that a mass shooter has NEVER targeted a place because it was a gun-free zone. But I’m saying that I don’t think we know or that we CAN know with absolute certainty that mass shootings occur in gun-free zones BECAUSE they are gun-free zones. I think it is likely that someone would not attack at a gun show because of all the guns and other weapons there, so while that statement may be true or at least likely, it doesn’t mean the opposite is also true. This is an argumentative fallacy. I do believe that mass shooters often feel a need to correct an imbalance or an injustice in their world (the Aurora Theater shooter is a great example of this as is the UC-Santa Barbara shooter), and as such will pick high-profile target-rich environments to execute their plans. They will sometimes speak of “the need for efficiency” as the UC-Santa Barbara shooter did. The Aurora Theater shooter’s plans, as found in his journal, also hint at great planning centered around efficiency. Thus I think the focus is MORE on finding target-rich public venues. The Aurora Theater shooter (and I refuse to acknowledge these guys as people) listed as main reasons for selecting it as: Isolated, Proximal, Large. I really enjoy your podcasts and appreciate your attention to detail. It will be a detail that snags most law abiding folk. In reference to church carry and school carry laws; in West Virginia, church carry is legal but carrying on school grounds is not. So in the case of a church that also has a school in the facility, is it considered church grounds on Sunday or any time school is not in session? Precidents have been set in other states to allow CCW on Sunday and Wednesday nights in this situation. As a member of a church security team, how would one confirm this? Talk to the local prosecuting attorney to see if they would prosecute in this situation? Change the laws? This may be a good podcast discussion. Thank you. Steven, I can’t speak to WV precedents or laws but as a general rule I have observed that in those situations the school is a school only on school days. To confirm I would talk to an attorney and ask them to research any precedents. If you strike out there it would be necessary to take it to an Attorney General and ask them to render an opinion on it. It is a good idea for the podcast! Yeah, I tend to agree with Jacob. See if you can find or get an answer from the Attorney General’s office. You know, it’s really going to depend on what the state laws are. If it is a church-operated school, then it would most likely be a privately-owned and operated school. This fact alone in many states would mean that it would be up to the church/school what the policy is on guns. But for sure public schools would be an issue. Great program. 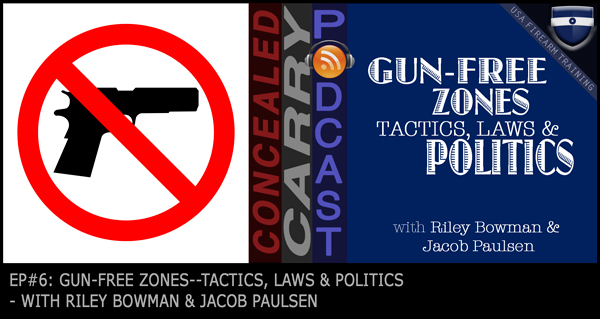 As a listener living in New Mexico the is another “gun free zone” you need to be aware of. Here in New Mexico as well as several other western states there are Indian Reservations where it is illegal to open or conceal carry unless you have a permit from that particular tribe or reservation. Just something to be aware of when traveling. troyg, good point! You are correct. Most Indian reservations are this way, so folks, please be mindful when traveling through them!